I love brown inks in the fall. Diamine Sepia has been on my list of inks to try for a while now. I purchased my bottle of ink from Cult Pens. Sepia is a yellow-brown with shading and a little bit of sheen. There is some nice shading on the ink drops, but there is a little bit of dark brown sheen as well. On Moleskine paper, which is not fountain pen friendly, there was a bleeding in all nib sizes, and a little bit of feathering. This is not an ink I would use on cheap paper. 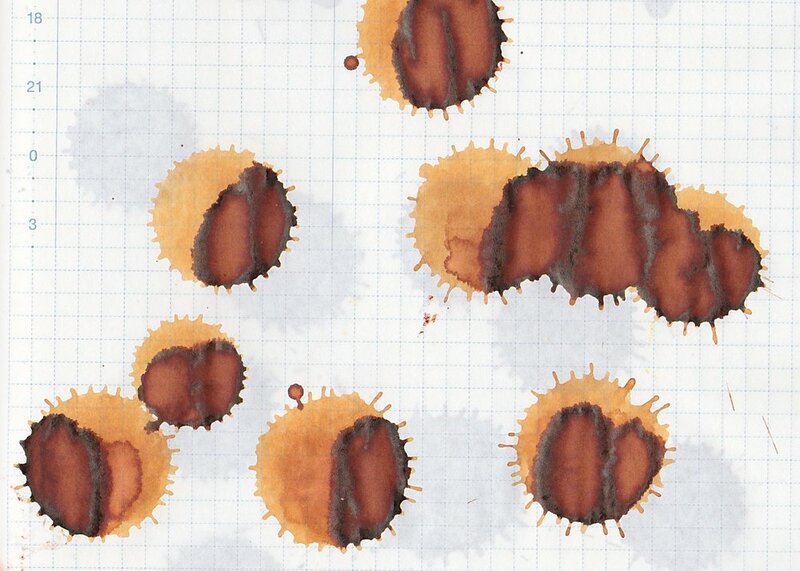 Ink swabs for comparison, left to right (top to bottom for RSS): Diamine Raw Sienna, Diamine Sepia, and Diamine Golden Brown. Click here to see the Diamine inks together. Sepia is a lot more yellow than any of the other browns. Robert Oster Marrone Mustard, Diamine Warm Brown, and Robert Oster Caffe Crema. Click here to see the brown inks together. I used a broad Pilot Vanishing Point on Tomoe River paper. The flow was nice, no issues there. Overall, Sepia is well behaved and has some nice shading and a bit of sheen. The dry time is a little it long at 40 seconds. I like browns, but this one is just a bit too yellow for me.